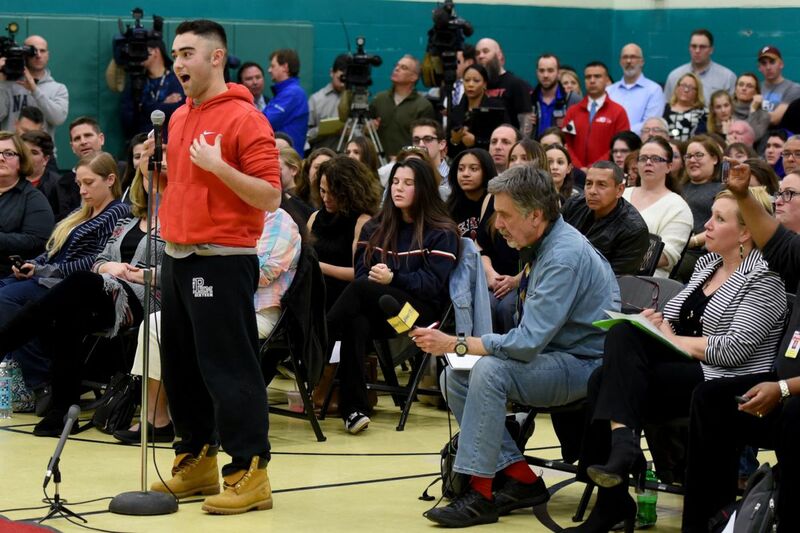 Cherry Hill High School East senior Sammy Miller during the Cherry Hill School Board meeting on Feb. 27, 2018 after protests by East students sparked by the suspension of teacher Tim Locke, who made comments following the Parkland school shooting. I'm a citizen, and I'm a strong supporter of gun control. Since the Feb. 14 massacre in Parkland, Fla., I've also been strongly supportive of the students who have walked out of school to demand stricter regulations of firearms. But I'm an educator, too, and my job is to prepare future citizens. So I need to make sure that I don't impose my views about guns on my students, who should always remain free to decide this issue on their own. That's the fine line that our schools and universities need to walk amid the spate of recent student walkouts. We should encourage students to express their opinions in whatever way they choose. But we must also avoid endorsing any particular set of views, which could inhibit student expression of contrary ones. Witness the recent statements of support from several universities, vowing not to penalize admissions candidates who are disciplined for protest activity at their high schools. The statements came in response to a threat by a Houston-area school district, which warned that students who walked out of school — or "disrupted" it in any way — would be suspended for three days. That's an absurdly draconian policy, antithetical to our best traditions of democracy, and I'm proud of our universities for challenging it. But I also worry that their statements reveal a bias toward my own side of the gun debate, which poses its own threat to democratic norms and — especially to democratic education. At Brown University, for example, the admissions office tweeted out a note that the school is a "socially conscious, intellectually independent campus where freedom of expression is fundamentally important." But the second part of the tweet left little doubt that some kinds of expression were more socially conscious than others: "You can be assured that peaceful, responsible protests against gun violence will not negatively impact decisions on admission to Brown." So, would pro-gun voices receive the same solicitude from the Brown admissions office? Perhaps so. But it's clear that Brown is taking a side on the gun issue, which can only alienate applicants or students who find themselves on the other one. Ditto for the University of Massachusetts-Amherst, which issued its own reassuring tweet to high school demonstrators. "If you participate in peaceful protests against gun violence and receive school discipline for walking out … we won't hold it against you," admissions officials wrote. Again, that's all fine and good — so long as people of a different opinion get the same consideration. The tweet is hardly reassuring on those grounds; to the contrary, it implies that UMass backs gun-control advocates over their opponents. Here you might reply, so what? After all, schools and universities are charged with keeping students safe. Why shouldn't they throw their political weight behind gun control and the students who are demanding it? Here's why: Because Americans differ, deeply and fundamentally, about guns. If a school endorses one side of that debate over the other, it will necessarily constrict the debate inside its own walls. You can't teach people how to discuss a question if it has already been answered. And that kind of indoctrination harms all of us, no matter what we think about guns. Advocates for stricter regulations will be less able to defend their position if they don't confront another point of view. And pro-gun students might not be able to express their views at all. At last week's Conservative Political Action Conference, several students reported that they felt stigmatized or muzzled because of their attitudes about guns. "'I'm on the 'wrong' side,'" said one 17-year-old student from Maryland. At his high school, he added, he was denounced for "supporting killers" because of his beliefs about the Second Amendment. "It's so upsetting to hear them say you're either for gun control or dead kids," said a recent high-school graduate from California, commenting on a common refrain at recent student walkouts. "It's like the feeling when you get bullied in high school because you believe something different." And that's what we all need to guard against, as the gun battle in our schools heats up. Of course we need to provide assurances for the student protesters, who should be free to express themselves however they wish. But we have to make sure that pro-gun voices are heard and protected, too. Most of all, we need to ensure that students and teachers alike remain free to say what they think. That clearly wasn't the case for Cherry Hill East history instructor Timothy Locke, who was placed on administrative leave after telling his class that he feared that a mass shooting could happen at the school. Of course it could. It could happen anywhere. And that's precisely why we need a full and free debate in our classrooms, which are supposed to teach us how to converse across our differences. Anything less will do violence to our democracy, all in the guise of purging gun violence from our schools.